Any movie that has a lounge singer is OK by me. Anyone who has ever glanced at their horoscope can attest those astrological predictions are not always what they're cracked up to be. In fact, they are usually pretty cracked themselves. For poor Jake Gibson (Cam Gigandet, desperately trying to find a star attraction in order to wipe Twilight off his résumé), his horoscope couldn't be any more inaccurate. Promoting a five-star day, complete with the promise of an improvement in his professional and personal lives, Jake's day only results in him getting laid off; returning home only to find his girlfriend getting laid. And so, Jake sets out to prove astrology is nothing but a big pile of horseshit -- but, as anyone who has ever farmed knows, a heap of manure can still yield some new life in itself. Jake's objective is to interview all of the other individuals born in the same hospital and on the same day as himself -- just to see if their lives are just as sordid as his own. Traveling across the country, Jake tracks down a single-mother (Jena Malone) with a low-life ex-boyfriend, a hospital employee who tries to keep kids off drugs (Brooklyn Sudano), and a lonely lounge singer (Max Hartman) in Atlantic City. Though they all possess similar miseries, their somewhat troubled lives are different from Jake's. However, as he comes to know these people, he cannot help but feel the need to help them. Is that what he was really meant to do, perhaps? 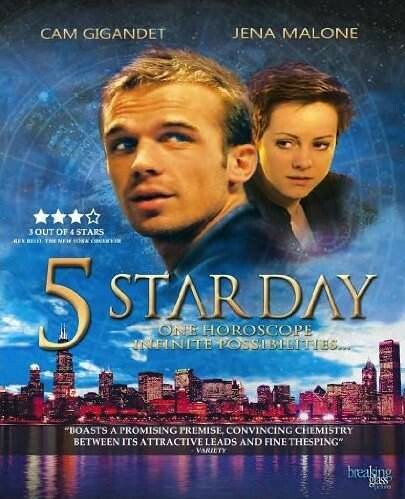 An enjoyable low-budget tale of self-discovery, Five Star Day depicts a jaded young man's journey to a new existence. Writer/director Danny Buday does a fine job keeping his film in check, and its actors deliver some good performances overall (Hartman is a delight, and has a wonderful crooning voice to boot). Also appearing are Will Yun Lee (as Gigandet's roommate), Chris J. Johnson, Nick Chinlund, and Julianna Guill. Mark Boone Junior makes a brief appearance as a homeless prophet, and Richard Riehle also had a cameo as a plumber, though his tiny scene was left on the cutting room floor. It's included, however -- along with several other deleted scenes -- in the special features. The bonus materials also include an audio commentary, a behind-the-scenes featurette, a still gallery, and a bonus short film from the Danny Buday entitled Dependency. In short: I liked it. Not enough to give it five stars to go with its title, mind you, but enough to give it about two-thirds of that.